ITAD Providers Opt for Refurbishing Over Recycling | HOBI International, Inc. There is a growing trend to refurbish rather than recycle as businesses are finding new methods to maximize profits through green initiatives. And when it comes to electronics. 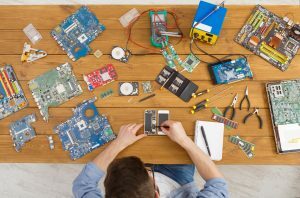 The days of disposing of IT equipment may be over as many businesses are finding that the responsible thing today is to implement a sustainable IT program by engaging with a reputable IT asset management company that can provide effective recovery, reuse and retirement of outdated and redundant IT assets. Analyst group, Zion Market Research predicts that by 2022, the IT Asset Disposition (ITAD) market will have reached a value of $18.7 billion. This is an increase of more than 65 percent from 2016 when the global ITAD market was valued at only $11.3 billion. Additionally, a Gartner report identified a number of factors making refurbishing even more relevant to today’s operations. Data security is just one of the key factors, which has now become a widespread issue since the introduction of regulation laws such as the General Data Protection Regulation (GDPR). “The only solution, and also a good way to reduce the environmental impact of recycled electronics, is to keep them around for as long as possible. Repair must always be the first option, it extends the life of electronics and ultimately optimises the planet’s resources,” he concludes.